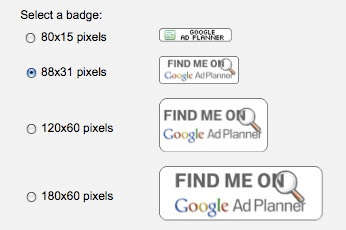 , we introduced the Google Ad Planner Publisher Center to help you showcase your site to advertisers. Now we've enhanced the Publisher Center to give you even more ways to promote and manage your Ad Planner site profile. As a reminder, any publisher can use the Publisher Center, but the user interface is currently only available in English. We've expanded the type of Google Analytics data you can share with Google Ad Planner. You can opt-in your page views, unique visitors (cookies), total visits, average visits per visitor, and average time on site, which ensures potential advertisers see the most accurate information for your site. Learn how to share your Google Analytics data. We invite you to sign in to Google Ad Planner now to try these new features, then send us your feedback and ideas so we can continue improving Google Ad Planner for you. In addition, don't forget to register for our upcoming Ad Planner webinar on November 24th, where you'll learn more about how to use the tool and how it can benefit your site. Earlier this year, we introduced the Google Ad Planner Publisher Center to help you showcase your site to advertisers. Now we've enhanced the Publisher Center to give you even more ways to promote and manage your Ad Planner site profile. As a reminder, any publisher can use the Publisher Center, but the user interface is currently only available in English.